Each of these geographical areas has regions that enjoy a Mediterranean climate. 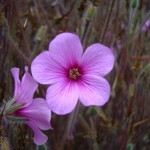 Hot dry summers, cool moist winters, dazzling sunlight, strong breezes and the occasional ground-clearing fire, create perfect conditions for many plants to thrive on the scrubby, rock-strewn landscapes. Although these regions cover less than 2% of the Earth’s surface, they contain more than 20% of all known flowering plant species, and their richness and plant diversity are considered second only in importance to tropical rainforests. Sadly, these plants are under serious threat from modern human developments in agriculture, tourism, housing and increasingly, climate change. 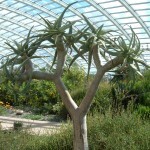 At first glance, it is not obvious that the plants in the Great Glasshouse come from six different places in the world. This is because they often share many qualities, such as small leathery evergreen leaves and dense shrubby forms, having adapted in similar ways to the similar environmental pressures they face. 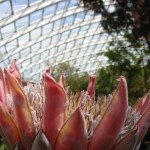 Kathryn Gustafson designed the imaginative flowing landscape inside the Great Glasshouse on which these plants thrive. Covering 3,500 square metres, its rocky terraces, sandstone cliffs and gravelled scree slopes are contoured to reflect the natural environment and to create a wide range of habitats, balancing light and shade and varying moisture levels to suit the needs of different plants.